The low standby power requirements and cost effective small batteries allow the panel to be mounted in a small discrete enclosure which is available in standard red or optionally in an attractive grey colour. Single board construction which allows easy removal of all electronic parts by removing just 2 screws and ample provision of cable entry knockouts simplify installation. 4 Amp notification appliance power and built in selectable sync protocols provide ample power and control for a wide range of standard notification appliances. 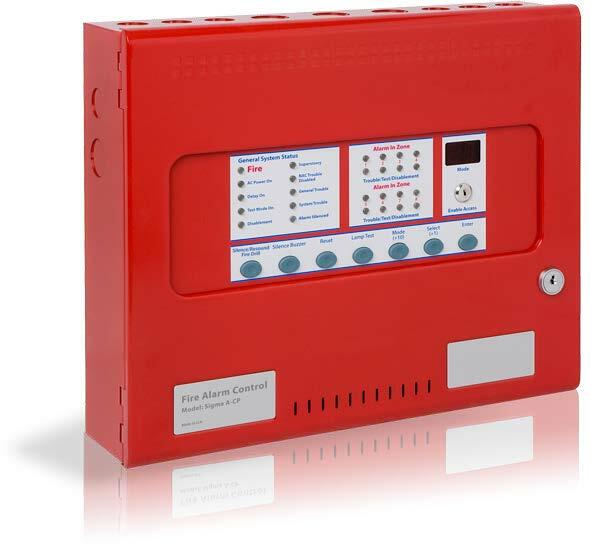 The built in RS485 communications bus provides the facility to connect 4 wire annunciators or ancillary relay boards to provide further indication and control options throughout a premises.